Edfu - Temple of Horus, Egypt. The following is the 6th message that we received in Egypt. You can find other messages on our website at www.alunajoy.com under the "Articles for Personal and Planetary Transformation" link. It might be a good idea to read them in order as each message builds upon the previous one. We are sharing this message here with you just as we received it, in present time, with very little editing. We do this for a very important reason. We know the messages that we receive are not just for our groups, but are for others as well. The Immortals, Horus, the Hathors, and other Star Masters and the Star Elders assure me that the message and the corresponding energy will be transmitted to you. So as you read this, you might want to imagine that you are with us. Also, always view the photos that we share, as photos also hold some energy of the sites. I can see that there is a lot to read here today. Let me see where to start. Horus is showing me many things, and the Star Elders are going to help me decipher the message. You know when a room is completely dark, and when we light one candle, we can see everything in the room? This was temple was built with the intent to bring back the light and to obliterate and claim victory over darkness. Horus gained victory over darkness in the way they could in the age that this temple was built. In that age, they would gain victory by having a righteous battle. When they show me this battle, I immediately question it, because this is not the way we are going to gain victory at this current time . . . right? The new age we are entering into is not about battling that which is out of balance anymore. In this new age, we will discover a different way to bring back harmony. Having a battle to gain power over something was the way things were done in the age we are leaving, and the age that this temple was built in. At this time in the past, we had to battle darkness with power over power. And even though, at that time, it was the right thing to do, it is no longer the right way to do things in this new energy. Underneath the stone, I can feel all kinds of stuff just wobbling all around. Do you feel that? Is just like liquid underneath your feet. It is like molten magma or something just trying to rise up. This temple sealed up, covered up, something that was out of balance. It might be what we might judge as darkness. There are other temples in other areas that also covered up darkness. Some of these don't exist anymore. They are just rubble or dust. Horus' temples were built to balance out negative vortexes at the last stages of Atlantis . . . before the fall and just after the fall. There are positive vortexes, and there are negative vortexes. Power is power, but some sites with their power will lift you up, and some will drain you. This temple was built on a site that drained people of their energy, their light, and the power. Horus built a temple on top of these vortexes to stop the issue of draining one's energy; but this temple was also built to use that same power, but in the opposite direction . In other words, these temples were built to re-define, elevate and raise any initiate that worked in this temple. We need to learn this now so we can see the contrast between this temple and other temple energies. I think this is why Horus checked us out when we arrived at the front doorway. He was checking us out to make sure we were working with positive energy. He says that the battle between the light and the dark is nearly over, but this old battle now acts like a capacitor to wake us up. A capacitor can trigger and activate one's spiritual path. In fact, the entire Earth is acting like a capacitor right now. So this battle appears to be at its most intense right now. But it is already written in Spirit that the battle that the darkness has been waging is futile. It has lost. The light has won. We are victorious. So there are no worries. The way we are going to work now in this new world has nothing to do with the way they worked in the past when they built this Temple. We will develop a new and different way to bring back harmony and light into the hearts of the living. We are leaving an era of survival of the fittest to an era where cooperation is survival. So this is why they started with the image of the candle in the room. How we are going to arrive at victory in this new emerging age is to act in a way that is the opposite of power taking over another power. The way we will work is simply by being the candle in the room. We are the candle in the world that is going to fill up the void that the illusion of the darkness appears to hold. Darkness is not the opposite of light. Darkness is simply the absence of light. It really is nothing at all. All we have to do is fill up empty space, that appears to us as darkness, with light! That does not mean that we begin going about fixing things that we "perceive" as being broken or out of balance. This new way is not about trying to make things better . . . like trying to help Japan, Saudi Arabia, Libya, the people outside that are trying to feed their families, etc…. Because when we see something as broken or out of balance, we actually hamper its recovery by our negative projection. How we gained victory at this point in our evolution is simply by being the light, so the darkness cannot exist anymore. When we shine, illusion and limitation cannot exist anymore. The lack of abundance and the lack of consciousness, all these are dark places, voids, in which we can place our light. Horus is still checking us out. Horus scrutinizes everybody that walks through the door. Horus and the guardians saw that we have pure hearts when we arrived. They are watching us to make sure that the energy field that holds this negative vortex down . . . stays down. Horus and the guardians have encircled us in a positive energy that will stay in effect until our candles get bright enough to light the world. This will continue even after we leave this temple. They say we are really very close to this victory, but that is something that we didn't already know. We already feel anticipation of the days and weeks ahead of us. Now I am seeing Horus and his guardians showing me something. You know in a baton race . . . when you pass the baton in a relay race? He is going to do that for us here. Only instead of passing the baton, he is going to pass a feather . . . a feather of a hawk. He is going to give each of you a feather of a hawk, as well as each person that comes in this Temple between now and the time our candles get bright enough to light the world. This feather is something that you put inside your heart along with the seed that we received the other day in Abu Simbel. So now we have the seed, a watering that gave it our orientation point, and the feather is going to give it flight . . . movement. It is going to give our light movement. The feather we are receiving gives us wings to actually make our new destiny manifest in the physical world. This feather is the spirit of flight, or the spirit of sacred, divine, purposeful movement. It is about one that can soar above the darkness, the past, our history, and all that was. When we arrived I was noticing how, on one side of the Temple, that all the deities were facing opposite of the ones on the other side of the Temple. The Temple is acting as a mirror image. What they are trying to show me is the floor is also a double-sided mirror. So it continually reflects down what is underneath , and continually reflects up what is above the floor up. This has something to do with what we are going to do next. Give me a second to watch this. Okay . . . The world we are now leaving and the world we are just entering are going to feel like a mirror opposite. Not by the way it looks physically, but by the core energy it contains. The core laws of nature that make our new dimension work will be almost a mirror image of the laws we just left. It is the opposite of survival of the fittest. It looks like for the guardians are soul tired, as it has been a long journey for them to hold the energy here. A lot of us (and those reading this) also feel a deep soul fatigue. They are ready to pass over the job to us. The funny thing is that we say sometimes that we are soul tired also. But Horus says that when we accept this new job, that tiredness, once we assimilate the new job, will go away . . . because the job is a mirror image from where we are at right now. We will be moving with the current instead against of it. But we have become used the battle. So, for a short time, during this shift from one age to the next, we will literally appear to be going backwards. So we might feel soul tired first, and then our energy will come back. We are regenerating. So that is kind of an interesting idea. It is like what the Maya call a Zuvuya. Group member Howard: In Palenque this past trip, you were talking about mirror image and learning to do the opposite. Aluna: Another purpose for this Temple is how to flip into another world. But you have to do it backwards, and that Maya word is Zuvuya. But in reality, it is not really going backwards at all. It will just feel like this for a time. Because what will happen is that we will actually right ourselves and be going in the right direction for the first time in a very long time. As soon as we started singing, the mirror that held their dimension from our dimension . . . that was holding the light here . . . was crossed over to us to care for. The baton for the job has just been passed. You may accept this job if you so choose . . . after all . . . it is your free will. I just noticed that all the condors / birds on the ceiling are flying out of the temple. If you remember, in most of the temples, they are usually flying into the temple. This means that our path is not about going into the Temple to learn anymore; it is about coming out and acting from what we have learned. It is also another lesson in learning how to create in the opposite manner from what we were used to. Also, when we were singing I was also shown that Horus is an aspect of Archangel Michael. 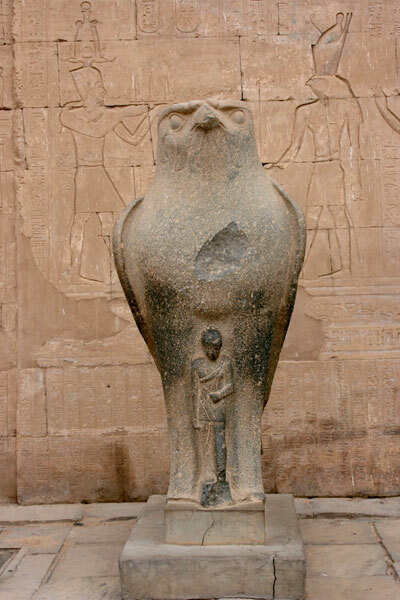 Horus is the great protector of the light, and the one that stands up and gains victory over darkness. There are a lot of guardians in the room now. They are giving us a uniform, costume, light suit for our new job. Remember this job is to anchor light in places where there is a void. Remember that there is no such thing as darkness; it is only the lack of light. This light clothing seals the victory of the light within us. Of course, at any time if you don't want this job, or you don't want what they are offering, all you have to do is say "No". No guardians of the light will ever do anything against your will. But what they are offering is to seal the new seed, the water that helps it sprout, the new orientation point in a place that is a void, and now a feather to give a flight. It is a code (cloak) of light. Now I don't understand what that means really, but it is a code of light around us, and it seals the victory within us. Group member Trish: The colors of light will show the codes of who we are. It is the light pattern. Aluna: Yes, because what does a uniform do? It identifies you. So maybe we will discover that there are other people out there in the world that also have the same code . . . the same code that has made it through the similar initiations. So when we are out in the world, we can join forces to make our candles brighter. Does that make sense? Because why else would you have a uniform but to be recognized, right? So this code of light that is around us will help us to be recognized. You know how when you meet someone on the street that you know you have always known them, but you just met them for the first time? It is that kind of recognition . . . a heart recognition. We will not be recognized by an ego or personality. But we will know each other by this code . . . a vibration code that is recognized by like codes, like frequencies. This code is untouchable by anything negative. So calling it armor would have worked too, but that would be defining it from the past dimension. You don't want to use the word armor, because that means you have to armor yourself against something, and we are already learning a lot on this trip about armor, and how we don't like it, want it or need it. So we don't want to armor ourselves. We just want to light up so bright that the darkness can't survive anymore. Because the way it worked in this past age / dimension is it took a lot of work, and it was heavy-duty, exhausting work. It was a long battle. Battle is unnatural to the human spirit. We are not supposed to battle through this next age. We are to fly through it, play through it and enjoy it. We have evolved enough to learn to create in a different way. Not to mention the fact that battling didn't work so well did it? Group member Diane: Regarding this mirror image, and this no battle idea, the Course of Miracles says that our safety lies in our defenselessness. When we see everything in the light . . . when we see everything in the perfection that it was intended, the safety lies in our defenselessness. Aluna: So we could also call it a cloak of defenselessness. That might work for what they gave us too. Even the Ascended Masters teach us about not putting our heads in the sand, and to not be afraid about seeing what is going on in the world. Pay attention to what is going on, but then remove your energy out of those things that are negative. Because anytime we put our attention on those negative things, it actually ADDS energy to the event or situation instead of healing it. An example . . . Regarding Japan . . . If we focus on what is going on there and worry or try to help or pray for Japan, what you are actually doing is actually sending energy to the situation that is making the problem worse. But if you see an issue, and then consciously pull your energy out of the situation, it starves the darkness. The Great White Brotherhood say to recognize the imbalances that are going on, and consciously pull your energy out of it, because it weakens it. You starve the imbalances in nature and in human kind. Group member Jakob: Like fire. You have three elements necessary to have a fire. Remove just one of these, and the fire goes out. You have to remove the burnable stuff, oxygen, or heat. You take that away, the fire is out. Aluna: So we have to put out the fires by taking away the energy that we have been giving it. At the same time, we need to be the candle to light up the void. What we are doing is actually quite simple. It is just about being who we are in every moment. Group member Trish: This place feels like the higher part of the solar plexus chakra rather than the heart chakra. Aluna: You are right. We are standing in the chamber, behind/above the heart chamber. In this temple, the heart chamber is roped off. There is a heart chamber in nearly every sacred site. The ancients always began building in a certain place, an energy spot, and they build out. Usually they build out the way we walk in. So when we walk in, we are walking into our own bodies. In the Maya lands, when you climb up a pyramid, you are actually walking into your own body also. When we enter a temple, you are basically walking through your own chakra system . . . awakening it with each step. But my favorite place is always the heart center of each site . . . the center of the Sun so to speak. So this chamber that we are in is one of the chambers that act as a protective shield that protects the heart of this Temple. We are working in the protective shield, and what happened? We received a code of light, a uniform, a cloak, so that in our old world we will be victorious and be recognized. Group member Enrique: You were talking now about a protective shield. Remember Hanab Pacal? (Lord Pacal of Palenque Mexico). When you talk about the code of light, it is a sunshield. It is what Pacal means! Sun shield! Also this meeting, right now, I had the flash that we were exactly doing the same that we are doing now thousands of years ago when it was the age of Atlantis. So one part of our group was going to come here to what was called Egypt. Another part of our group was going to the Maya lands. And this is the same way that we were getting prepared for the beginning of a new time, possibly at the same moment, with exactly these kind of teachings, (and) sharing with each other what we know. So we are just going back to the beginning of the circle that is going over and over, and everybody will be here again at the end of this next era . . . some thousands of years in the future . . . possibly in this same room. Aluna: Now I am feeling the gratefulness of us being here and taking on this baton/job. Instead of being a heavy, oppressive job, it will be a job where we will feel rejuvenated. Some of us were born soul tired because this life has been moving against our natural frequencies; not with them. I never could understand why we would come here with that kind of life ahead of us, but we did. Because of who we are, we will rise to the next level. We will feel rested, and feel at home, because we will finally be in a place where we are working WITH the natural creative forces instead of against them. In this site, this temple of Horus, we learned about honoring both sides. And maybe we couldn't have done this today, unless we would have done what we had done this morning (read message from Kom Ombo). Do you understand what I am saying? It is all tying together very beautifully.